Cette liste n’est certainement pas exhaustive. Elle est basée sur les recommendations personelles de membres (anciens et actuels) du conseil directeur de Conscience Canada. 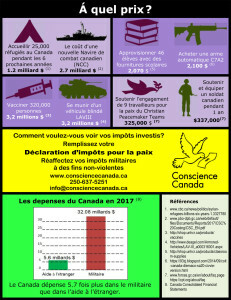 On trouve d’autres ressources sur l’internet, y compris sur le site du Centre de ressources sur la nonviolence : http://nonviolence.ca/index.php/le-centre/ et sur le site du War Resisters International : http://www.wri-irg.org/taxonomy/term/9?page=3 . 2) Pray the Devil Back to Hell – documentary film directed by Gini Reticker and produced by Abigail E. Disney. Won “Best Documentary” at the 2008 Tribeca Film Festival. The film documents the Women of Liberia Mass Action for Peace peace movement. Organized by social worker Leymah Gbowee, the movement started with praying and singing in a fish market. Leymah Gbowee organized Christian and Muslim women of Monrovia, Liberia, to pray for peace and to organize nonviolence protests. Dressed in white to symbolize peace, and numbering in the thousands, the women became a political force against violence and against their government.